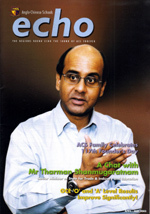 The ACS Board of Directors publishes the Echo magazine four times a year. It is distributed in-class to students of the seven Anglo-Chinese Schools and has a guaranteed circulation of 11,500 copies. 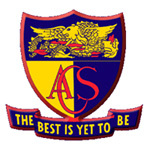 It is used as a tool to engage the interest, support and participation of students, their parents and old boys in the ACS family of schools. 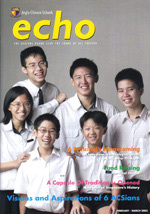 The Echo has a readership estimated at more than 25,000 making it the largest circulated school magazine in Singapore. The magazine is aimed at informing, entertaining, enriching and motivating its student readers. It reaches out to students in two Primary schools, two Secondary schools, a Junior College and two International schools. Parents read it to stay informed and to keep in touch with the school’s activities and the latest trends in education. Its editorial content covers a wide range of topics that are of general interest to students, their parents and the old boys of the school and written in a style that gives them a truly enjoyable reading experience. It covers real life issues that are relevant to their lifestyle such as exam stress, time management, peer pressure and most anything to do with those growing years. Principals, teachers and students also contribute articles that are informative and educational and include sporting and academic achievements of the schools. 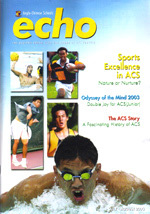 It is an important source of information for parents, ACS old boys and educators. 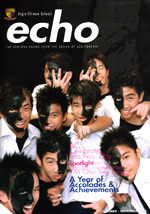 The Echo is packaged in a way that appeals to the youth. 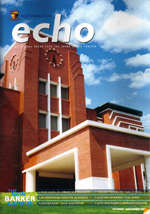 The Echo provides an ideal environment in which to promote sports goods, educational products, computers and electronics, entertainment, food and beverages, and generally all those products that target students and their parents. By advertising in the Echo, you will be reaching an exclusive segment of a vibrant and impressionable youth market and as its circulation is guaranteed, it offers the advertiser genuine value for his advertising dollar. Artwork: CD in pdf high resolution with cropped mark and bleed in CMYK mode.